Home > Day Operations > What Is Stereotactic Radiosurgery? Radiotherapy has been used to treat different cancers for decades, and is often used to try to shrink tumours that are too difficult to operate on. Early forms of radiotherapy were not very highly targeted, so when broad beams of radioactivity were directed at the tumour, they inevitably reached a wide area of normal tissue. This caused widespread tissue damage, and was responsible for many side effects. Over the last 20 years, radiotherapy has become much more sophisticated. Better direction of the radiation beam is now possible and two major developments have made radiotherapy far more accurate. The first is intensity modulated radiotherapy (IMRT), which enables the dose of the radiation to be controlled very easily, allowing only the maximum tolerated dose to reach normal tissue. This has significantly reduced the scale of the side effects experienced after radiotherapy. For example, someone having radiotherapy 15 years ago to shrink a tumour in their oesophagus, may have risked damage to their skin, chest wall, lungs and heart. Today, the radiotherapy beams can be less damaging to normal tissue, and surviving a primary cancer no longer means that you then have to live with the long-term damage caused by the radiotherapy treatment. Another major development has been image-guided radiotherapy (IGRT). This has perhaps made the most difference. Instead of relying on human skill to look at an X-ray image and decide where to focus the radiotherapy beams, IGRT combines a CT (computerised tomography) 3D scanning facility with the equipment that delivers the radiation. The images are fed into the computer that controls the release of radiation. The IGRT machine can then focus the radiation much more accurately on the tumour. The latest development in radiotherapy is a natural progression from IGRT, but involves equipment and technology that is an order of magnitude more sophisticated. Stereotactic radiosurgery does not involve physically cutting into the body. 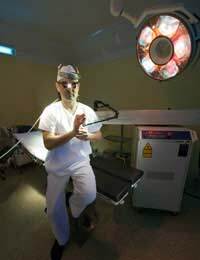 Instead, a powerful IGRT machine known as a Cyberknife delivers very high-energy radiation directly at a tumour, and it can do this on any tumour at any site in the body. Stereotactic radiosurgery has become very well accepted over the last 20 years, as a therapy that can be used on the most complex, inoperable tumours. It can target tumours that are positioned very close to major organs, nerves or blood vessels and is so accurate it can hit the tumour with full force, leaving normal tissue just fractions of a millimetre away completely untouched. What Is Stereotactic Radiosurgery Used For? Pancreatic and liver tumours can be very difficult to treat, because they are almost inaccessible to a surgeon. This makes them excellent candidates for stereotactic radiosurgery. Others include brain tumours, tumours that lie next to major blood vessels, benign tumours of the ear, nerve compression at the base of the brain, and lung tumours. Images of the exact position of the tumour are programmed into the Cyberknife, then as it delivers the high-dose radiation beams, it constantly takes new images of the patient’s body. This means that as well as targeting the tumour very accurately, and allowing for any changes that may occur over even a short time, the machine can actually compensate for the movements involved in breathing. Patients having stereotactic radiosurgery treatment do need to be physically fixed to the treatment table. They can simply lie down and relax while the Cyberknife does its work. Stereotactic radiosurgery may only take about an hour to perform and, as there are no incisions, it does not cause pain. After resting for an hour or so, you can simply get up and go home afterwards.